Social enterprise has been a growing practice in the non-profit sector, with innovators seeing value in using the market to accomplish social goals and governments showing increased interest in this model for pragmatic solutions to social issues. In Manitoba, the Canadian CED Network’s (CCEDNet) members have focused on social enterprise as a vehicle for poverty reduction through supportive job creation. Following the 2013 Social Enterprise World Forum in Calgary, CCEDNet – Manitoba convened the Social Enterprise Working Group to consider what it would take to strategically scale up the impact of social enterprise in Manitoba. That meeting resulted in a policy resolution approved by CCEDNet – Manitoba members later that year asking the Province of Manitoba business model to realize social, cultural and environmental outcomes, such as fostering a more sustainable environment, providing important community services like child care, generating revenue for non-profits or creating jobs and training opportunities for people with barriers to employment. Some social enterprises are programs or forprofit subsidiaries of parent organizations, while others encompass the whole to work with the community to co-create a strategy to grow social enterprise. Although social enterprises address a wide range of issues and exist in a wider range of sub-sectors and industries, members focused on job creation for people with multiple barriers to employment. Along the same timeline, the Manitoba government has also being working on job creation. In 2012, the province set a target of adding 75,000 new workers to Manitoba’s economy by 2020. The 2013 Speech from the Throne set out an ambitious skills agenda focused on jobs creation, growing the Manitoba economy and creating opportunities for young people. The province has also been undertaking structural changes to better operation of a non-profit. Social enterprises have proven effective at delivering community-led, sustainable solutions to the complex problems facing our communities while making up a large and growing proportion of our local economy. In 2013, CCEDNet – Manitoba updated a survey of the size and scope of the social enterprise sector, first completed in 2010. The 125 social enterprises that responded were from a broad range of enterprises, align training resources with its poverty reduction and social inclusion activity. In 2012, responsibility for Employment and Income Assistance was moved into the Jobs and the Economy department, and in the spring of 2013, the province released its Strategy for Sustainable Employment and A Stronger Labour Market, outlining a new strategic vision for these efforts. 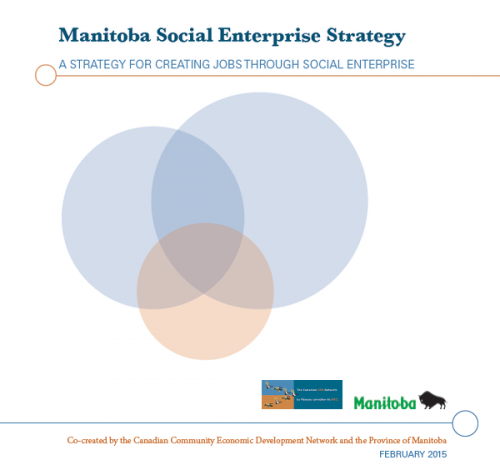 After bringing CCEDNet – Manitoba’s policy resolutions to the attention of the relevant Ministers, the Province of Manitoba made a commitment in Budget 2014 to work with social enterprises to create a comprehensive strategy to grow the sector and create more first jobs, noting the value and opportunity presented by social enterprise.